Yahoo! Store Automation - Click Trail Interface: Automatically Download Yahoo! Store Click Trails! 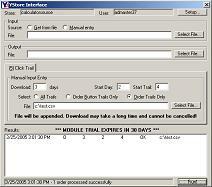 Click Trail Interface is a YStore Inteface module that allows you to download full click trails for your store. Click Trails are an excellent feature of Yahoo! Store, but the Store Manager interface severely limits their usefulness for everyone and makes them virtually useless for stores with significant amount of traffic. With all the click trails in one file the data can be reviewed, organized, moved, and manipulated in many exciting ways finally allowing you to get meaningful insight into your customers' interactions with your store! Special Flag - identifies and highlights special situations such as "into shopping basket", "out of shopping basket", "place order", "show shopping basket", etc. CSV format allows data to be easily opened and manipulated in any spreadsheet or database program. When no URL is available program will record text in URL compatible format (e.g. "http://#") to simplify aggregating information, using a log analyzer, and otherwise working with information. Each type of special situation such as "Show Shopping Basket" and "Place Order" is assigned a unique URL and Page Title to simplify viewing and data aggregation. For example, every order placement entry will have the same URL and Page Title so that when aggregated you can see the total number of orders. Can download one day (perfect for automatic nightly download) or any number of days (up to what is currently available in Store Manager). Offers the ability to select the starting day and starting click trail for download of specific information and easy recovery from interrupted downloads. Allows your staff to work with click trail information without gaining access to the Store Manager.